Brazil's President Jair Bolsonaro speaks during ceremony at the Planalto Presidential Palace in Brasilia, Brazil, March 25, 2019. Far-right President Jair Bolsonaro's call to commemorate the anniversary of Brazil's 1964 military coup is causing discomfort in Latin America's largest nation, with social groups organizing protests and the federal prosecutors' office saying the call "deserves social and political repudiation." Bolsonaro, a former army captain who waxes nostalgic for the 1964-1985 dictatorship, on Monday asked Brazil's Defense Ministry to organize "due commemorations" on March 31, the day historians say marks the coup that began the country's military regime. The reaction was immediate. On Tuesday, federal prosecutors said that under international criminal law Brazil's dictators "had committed crimes against humanity." In a long and strongly worded statement, prosecutors said Bolsonaro's initiative sounded like an "apology for the practice of atrocities." Several civil groups announced that they were organizing protests throughout the country. A Brazilian lawyer reportedly filed a class action suit, arguing that commemorations were not in the public's interest. The decision to commemorate the coup anniversary ended a 2011 move by then-President Dilma Rousseff, who had asked armed forces to suspend such commemorations. Rousseff, a former guerrilla, was jailed and tortured during the dictatorship. "This means that (Bolsonaro) thinks the dictatorship against opponents, against political dissidents, is not a dictatorship," said Rosa Cardoso, a lawyer who coordinated Brazil's national truth commission. "That the illegitimate use of force is not violence when imposed on those who have different beliefs, that torture is not torture but a fair and justified treatment." 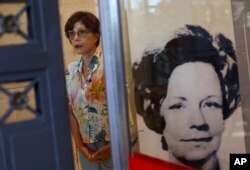 Rosa Cardoso, a lawyer who led Brazil's national truth commission talks, as she stands next to a photo of Lyda Monteiro da Silva, who was the secretary of the Order of Attorneys of Brazil and who was killed while opening a letter bomb addressed for the president of the Order in 1980, in Rio de Janeiro, March 26, 2019. In 2014, the truth commission concluded that at least 434 people were killed or disappeared during the dictatorship. Among indigenous communities, the death toll rose sharply, according to the report. It is estimated that between 30,000 and 50,000 people were illegally arrested and tortured, the prosecutors' office said. Bolsonaro's discourse "shows a deep ignorance and lack of acknowledgment of a doctrine that is internationally accepted," Cardoso said. Bolsonaro's praise for the dictatorship has shocked many Brazilians but seduced others, leading to his election as president last October. He has said the dictatorship should have gone farther in killing communists who threatened Brazil. On Monday, government spokesman Otavio Rego Barros said during a press conference that "the president does not believe March 31, 1964 was a coup." "I never thought I would hear this," Alvaro Caldas, a former guerrilla fighter who was jailed, kidnapped and tortured under military rule, told the Associated Press from his Rio de Janeiro apartment in Copacabana. Alvaro Caldas, who was tortured during the dictatorship, shows a photo of himself after being arrested and injured during the Brazilian dictatorship at his home in Rio de Janeiro, Brazil, March 26, 2019. "I feel as if the torture has returned, and can return," Caldas, now a 78-year-old retired journalist, said while looking at an old photo of himself with two puffy, black eyes. The photo, he said, was taken in 1983, when the military allegedly kidnapped him and interrogated him for about a week before releasing him. "This is what Bolsonaro wants to celebrate, the humiliation of the human being," he said. Another militant and torture victim, Crimeia Alice Schmidt de Almeida, deplored the lack of military convictions for human rights abuses. "We have no one in custody, or at least condemned," said de Almeida, who was sent to a torture center in Sao Paulo in 1972 when she was eight months pregnant. 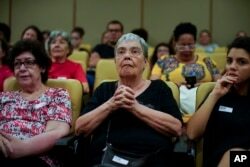 Crimeia Alice Schmidt de Almeida attends a women's seminar at Sao Paulo's municipal chamber, March 26, 2019. A few retired members of the military have been charged with crimes, but an amnesty law has prevented most prosecutions linked to abuses under the dictatorship from leading to convictions. Barros, the government spokesman, did not give any details about the kind of events that might be held for the March 31 commemorations. The Defense Ministry said the presidential decision consisted mostly in including the March 31 date on the military's agenda, along with a text that could be read in military facilities. But it is up to each facility to decide what to do. The Southeast military command in Sao Paulo, for instance, has said it will form ranks on March 28 in relation to the 1964 "the democratic revolution."